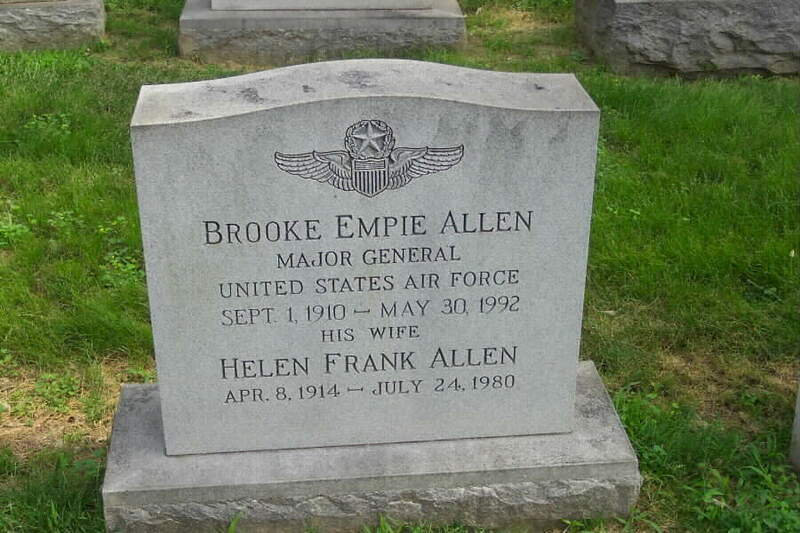 Major General Brooke Empie Allen was commander of Headquarters Command, U.S. Air Force, which has the mission of supporting Headquarters U.S. Air Force and other Air Force units in the Washington area. In addition to overall command of Andrews and Bolling Air Force Bases, it administratively supports some 30,000 Air Force personnel in more than 600 worldwide locations. These include personnel in the Federal Aviation Agency, National Aeronautics and Space Administration, Defense Supply Agency, Military Assistance Advisory Groups, Defense Intelligence Agency, air attache offices, the North Atlantic Treaty Organization, and unified commands and other organizations. It is the Air Force command directly involved with the nation's capital, the president, national and international dignitaries, music and astronauts. General Allen was born in Columbus County, North Carolina, in 1910. He graduated from Davidson College, North Carolina, with a bachelor of arts degree in 1933, and was commissioned a second lieutenant in the Infantry Reserve on June 1, 1933. Later that month General Allen was appointed a flying cadet and in June 1934 graduated from flying school at Kelly Field, Texas. He was then assigned to Mitchel Field, New York, where he received his regular commission as a Second Lieutenant, U.S. Army Air Corps October 1, 1936. Transferred to Hickam Field, Hawaii, in September 1939, General Allen served with the 18th Bomb Wing, later redesignated the Hawaiian Air Force and finally the Seventh Air Force. On December 7, 1941 he was one of two B-17 pilots who took off from Hickam Field while it was under attack by the Japanese. As commander of the 42nd Bomb Squadron he led the squadron of B-17s in four attacks against the Japanese Task Force during the first two crucial days of the Battle of Midway in June 1942. Assuming command of the Fifth Bomb Group at Guadalcanal in November 1942, General Allen retained command when it was transferred to the Thirteenth Air Force in early 1943 and accumulated more than 350 combat hours. Returning to the United States in August 1943, General Allen was appointed deputy for operations and training of the Second Air Force at Colorado Springs, Colo., which trained the majority of the B-17, B-24 and B-29 bombardment crews for overseas duty. He later assumed command of the 20th Bomb Wing (Very Heavy) which was organized at Colorado Springs for deployment to the Far East. In August 1945 he entered the first command course of the Command and General Staff School at Fort Leavenworth, Kan. 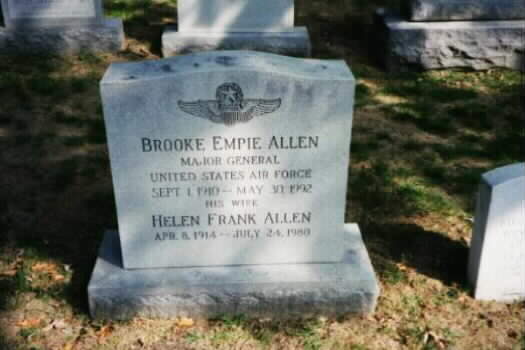 Upon graduation he was appointed deputy commander, North Atlantic Wing, Air Transport Command, Westover Field, Massachusetts In July 1946 he became chief of staff to the U.S. Air Force Representative, United Nations Military Staff Committee at New York City. 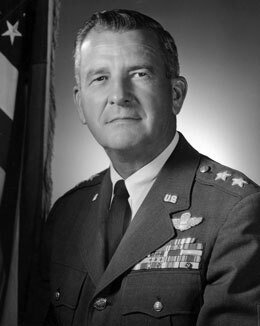 General Allen was transferred in May 1948 to U.S. Air Force Headquarters and served in the Directorate of Intelligence for the most part as chief, Air Targets Division. In February 1951 he was appointed commander of the Air Pictorial Service, Washington, D.C. General Allen retained command when the Air Pictorial Service was redesignated the Air Photographic and Charting Service and made a technical service of the Military Air Transport Service. In September 1952 General Allen was appointed chief of staff of the Military Air Transport Service, Andrews Air Force Base, Maryland. Reassigned to U.S. Air Force Headquarters in July 1954, he was designated director of information services in the Office of the Secretary of the Air Force. The following April General Allen assumed command of the Continental Division of the Military Air Transport Service at Kelly Air Force Base, Texas, and in July 1957 he became commander of the Sixth Allied Tactical Air Force at Izmir, Turkey. Returning to the United States General Allen assumed command of Headquarters Command, U.S. Air Force at Bolling Air Force Base in Washington, D.C., July 29, 1959. The general, while serving in Europe, received the Degree of Knight Commander of the Royal Order of the Phoenix from Minister of Defense of Greece, George Themelis. General Tekin Ariburin, chief of staff of the Turkish Air Force, also made General Allen an honorary member of the Turkish Air Force. His decorations include the Distinguished Service Cross, Silver Star, Legion of Merit with oak leaf cluster, Distinguished Flying Cross, Air Medal, Army Commendation Ribbon with three oak leaf clusters, Navy Presidential Citation, Purple Heart, and the Chinese Cloud Banner Decoration. He is a rated command pilot, combat observer and aircraft observer.